An vegan alternative to getting your deliciously bloody rare burger has been created by biochemist named Patrick Brown; just take a look at this appetizing picture below! [It's an] alternative strategy to produce entirely meatless hamburgers that look and taste very much like meat. That's one above, looking sufficiently burgerlike; it's even got that pristine medium-rare thing going on. Patties now being made by Brown's Impossible Foods are suffused with something called heme, it turns out, a molecule that comes from the roots of nitrogen-fixing plants but has the iron-tinged character of hemoglobin. "I remember this is what it felt like to get punched in the face," Brown tells the Wall Street Journal, relating the instant he realized that the vegan substance could be used to simulate the role most traditionally played by blood in a bloody rare hamburger. 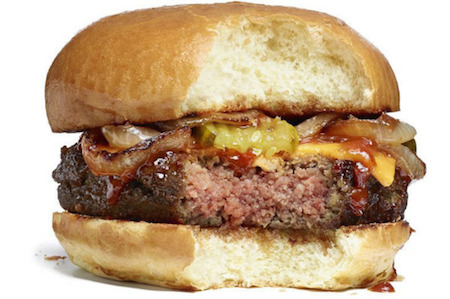 Now Impossible Foods has $75 million in venture capital, including cash from Bill Gates and Google Ventures. Have science fiction writers been wasting their time on developing ideas for alternative meat production?